Priscilla is certainly pretty in pink! 3 stems of gorgeous and incredibly fragrant pink Oriental Lilies, each with at least 1-2 large and impressive blooming heads, will overwhelm your recipient. 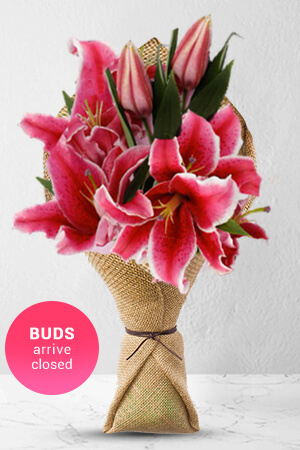 This is the bouquet to sent to impress the special women in your life.Lilies may be sent some closed/partially closed in order to prevent damage and to last longer.Our bouquets do not include a vase. However, for a bigger impression we recommend a Superior vase, which is an ideal selection for this gift. It was excellent!! All i had to do was place the order and evrything was taken care of. Delivered exactly as was requested (date / time). Will be using this service again. My order was delivered on time and the recipient was very happy with her flowers.